In a medium bowl, dissolve 1 1/2 teaspoons of cornstarch in the sherry. 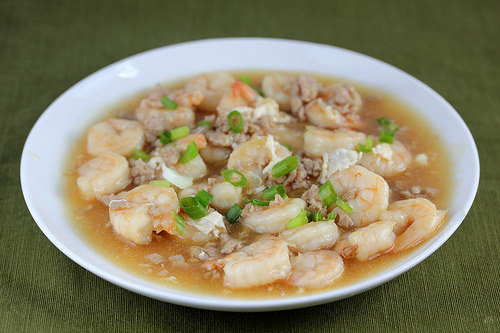 Add shrimp to the bowl, and toss to coat. Heat oil in a wok or large skillet over medium-high heat. Add shrimp, and fry until pink, 3 to 5 minutes. Remove shrimp to a plate with a slotted spoon, leaving as much oil in the pan as possible. Add garlic to the hot oil, and fry for a few seconds, then add the ground pork. Cook, stirring constantly until pork is no longer pink. Combine 1 cup water, soy sauce, sugar and salt; stir into the wok with the pork. Bring to a boil, cover, reduce heat to medium, and simmer for about 2 minutes. Mix together the remaining 1 1 /2 tablespoons of cornstarch and 1/4 cup cold water. Pour into the pan with the pork, and also return shrimp to the pan. Return to a simmer, and quickly stir while drizzling in the beaten egg. Serve hot over rice. No comments for: "Shrimp with Lobster Sauce Recipe"